It's easier than you might think to turn the balcony or patio of your Springs luxury apartment home into a bountiful garden. Get started with these great suggestions for the best fruits, vegetables and herbs to include in your selection. 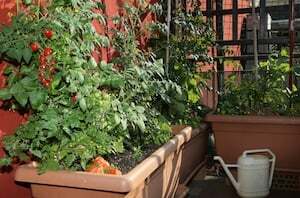 The versatility of tomatoes makes them the #1 veggie choice of most home gardeners. Slice and eat them as is, add them to a green salad or use them in a variety of soups and sauces. In addition to adding color to dishes, bell peppers are nutritional powerhouses packed with vitamins and antioxidants. Growing bell peppers in container gardens is ideal for areas with cooler climates. Everyone loves potatoes, whether they're mashed, fried, scalloped or roasted. But eating a potato fresh from the garden can give you a whole new appreciation of this popular vegetable. Growing potatoes is also a fun project for kids. There's nothing better than plump, juicy strawberries in yogurt, as a cereal topping or just by themselves. Strawberries are generally thought of as needing a lot of room, but they actually do well in containers and can even be grown indoors. If you want a vegetable that works in both savory and sweet applications, zucchini fits the bill. "Zoodles" are a low-carb stand-in for pasta, and warm zucchini bread pairs nicely with a good cup of coffee. Yes, it's true! Everyone's favorite summer fruit can be grown vertically in a container. Watermelon is ripe when tapping on the surface produces a hollow sound. Spinach is well-suited for growing in containers. This leafy green, nutrient-rich vegetable doesn't need a lot of space, sunlight or special care to thrive. Herbs are a staple of any healthy diet. They're a perfect way to add flavor without adding calories, and you can experiment to find your favorite combinations. A delightful benefit of including herbs in a balcony or patio garden is that they lend themselves to a wide range of different containers that are decorative as well as practical. Too much water is no better than not enough. Containers should have a half-inch drainage hole in the bottom, with one inch for large containers. Understand the different sun exposure terms. Get an approximate measurement of the light on your patio or balcony by placing a container in a certain spot and timing how long the sun hits it. Since space is limited, review growing requirements carefully and choose plants that require similar conditions. Don't skimp on potting soil so your plants get sufficient water and nutrients. Share your favorite "green thumb" tips in the comments!